DHC Training & Consulting Group in addition to The Retired Spy are proud to be an Agent Of Change for Playing It Forward For Wishes campaign benefiting Make-A-Wish ® Eastern Ontario Adopt-A-Wish ® program. What a privilege and honour to take part in a small way in order to make a different in a life of a child. THANK YOU Playing It Forward For Wishes for the opportunity to take part in and be an Agent Of Change. We are forever grateful for the opportunity to give back to our community…MERCI! 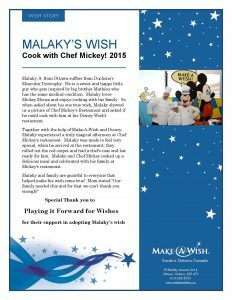 Malaky’s wish: Cook with Chef Mickey!Malaky showed us a picture of Chef Mickey’s Restaurant and asked if he could cook with him at his Disney World restaurant. Beth’s wish: To meet Carol Burnett!Ever since she was a little girl she enjoyed watching older comedy shows like “I love Lucy” and that’s where she discovered Carol Burnett and fell in love with her different characters. 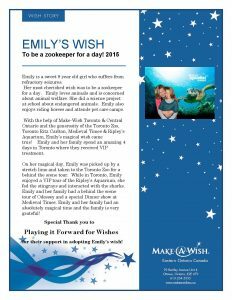 Emily’s wish: To be a zookepper for a day!With the help of Make-Wish Toronto & Central Ontario and the generosity of the Toronto Zoo, Toronto Ritz Carlton, Medieval Times & Ripley’s Aquarium, Emily’s magical wish came true! 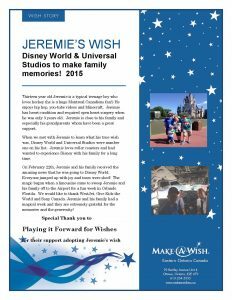 Jeremie’s wish: Disney World & Universal Studios to make family memories!When we met with Jeremie to learn what his true wish was, Disney World and Universal Studios were number one on his list. Jeremie loves roller coasters and had wanted to experience Disney with his family for a long time.